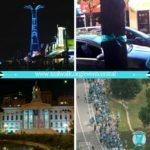 T.E.A.L.® partnered with Toyota for the 3rd Annual Savannah T.E.A.L.® Walk in 2016. 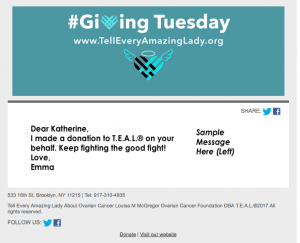 Through a customized sponsorship opportunity, Toyota created a co-branded campaign to help T.E.A.L.® spread awareness while supporting participants of the walk. For the T.E.A.L.® Toyota Roadtrip, 5 individuals including survivors, organizers and participants as well as co-founder, Pamela Esposito-Amery were able to drive five Toyota Rav4’s decorated with custom co-branded T.E.A.L.® logos into Savannah from three different states including Florida, North Carolina, and Georgia. For the accomplishment of reaching the finish line, Toyota brought in tents and caterers for the T.E.A.L.® Toyota Tailgate Celebration, which consisted of a southern style brunch and entertainment including an appearance from Sonny Digital’s manager Rico Brooks. Regional Director of Toyota, Michael Esposito was also there to present a check to T.E.A.L.® to support Ovarian Cancer research and awareness programs. 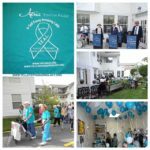 Toyota also supported the raffle and T.E.A.L.® Survivor Ceremony with prizes and awards. 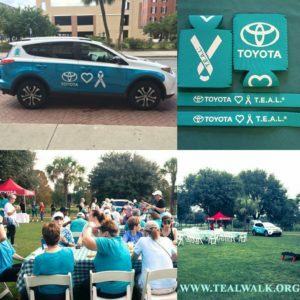 To help promote the 3rd Annual Savannah T.E.A.L.® Walk, Toyota created the co-branded logo and hashtag #ToyotaLovesTeal as well as co-branded swag items and a step & repeat photo booth. The campaign included social media influencers who helped further spread the message. This amazing collaboration also resulted in an official Toyota Loves T.E.A.L.® promotional video. Check it out here.